Aberdeen manager Mark McGhee believes he is close to signing Amiens defender Reda Johnson. McGhee returned from a trip to Paris on Thursday without tying up a deal for the 21-year-old centre-back. 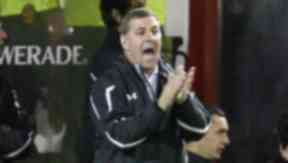 "I'm trying desperately to sign Reda Johnson and I'm close to signing him," McGhee told BBC Scotland. "By Sunday I may have finalised a deal that will see him arrive on Monday. "We then can sign him and register him for Thursday if we want to." McGhee has been trying to sign Plymouth pair Jim Paterson and Steve MacLean on loan without success. But he will strive to bring in at least two players before the transfer deadline at the end of August, and is happy with all the members of the first-team squad he inherited from Jimmy Calderwood. "I want all of these boys and in fact some of them have only a year left and I've been talking to them already about prolonging their contracts," McGhee said. "We have a strong nucleus but we are maybe two or three, or maybe even four short of the squad I would like. "We're not probably going to be able to afford four players so we're trying to squeeze three out of the resources we have."